Tennessee Williams based his screenplay on Oscar Saul's adaptation of Williams' Pulitzer Prize-winning play set in a grimy New Orleans project. The story of the fragile sentimentalism of a former prostitute who visits her sister only to be taunted mercilessly by her childish brother-in-law. Academy Award Nominations: 12, including Best Picture, Best Director, Best Actor (Marlon Brando), and Best Screeplay. Academy Awards: 4, including Best Actress (Vivien Leigh), Best Supporting Actress (Kim Hunter), and Best Supporting Actor (Karl Malden). The director's cut contains three minutes of previously censored footage. Frankly, I rarely care for film adaptations of stage plays, and I had little reason to think that 1951’s version of Tennessee Williams’ A Streetcar Named Desire would be any different. Sure, the project has maintained a strong reputation over the years, but other stage adaptations remained well known too, so why should I like this one? I suppose because it’s really good. At times the stage-related trappings of Streetcar got on my nerves, but as a whole, it provided a rich and well-executed experience that developed nicely as it progressed. Streetcar focuses on the story of Blanche DuBois (Vivien Leigh), a faded Southern belle who comes to visit her sister Stella (Kim Hunter) at the New Orleans apartment she shares with her husband Stanley (Marlon Brando). Blanche arrives under somewhat questionable circumstances, and as the story unfolds - while Stanley becomes more and more suspicious - we learn additional details of her less-than-graceful exit from the DuBois estate. Some of my interest in Streetcar stemmed from the opposing acting styles found in it. As withering southern rose Blanche, Vivian Leigh provides a performance that often skirts the theatrical borders of campiness, and during the early parts of the film, I thought she seemed awfully affected and fake. However, as the movie progressed, I saw the method to her madness. Blanche needs to be broad because of the character’s mental instability. Had she been played as a more realistic person, the grand nature of her problems would have seemed less involving. Leigh’s work contrasts sharply with the nicely naturalistic performance of Marlon Brando as Blanche’s brother-in-law Stanley. Brando provides a sublimely subtle yet powerful job here. He makes Stanley strong and brutish but always keeps him human. Brando manages to create a forceful presence who shows nuances not usually found in this type of role. The aspect of Stanley I found most difficult to believe came from Brando’s physique. Since we saw him as a fat guy for so long, it’s hard to accept Brando as a hunk, but well-muscled and firm he was half a century ago. Streetcar often works simply because of this study in opposites. The two actors exhibit a strong chemistry that makes their time shared on-screen all the more valuable. Between fragile, delicate Blanche and rough, surly Stanley, something’s got to give, and by the end of the film, it does. The performances create a very memorable experience. I also liked the manner in which Elia Kazan opened up the original stage production. I often dislike films adapted from plays just because they remain so true to their roots; the directors frequently do little to broaden the visual experience and make it appropriate for the big screen. In some ways, that seems to occur here as well, since Streetcar usually remains firmly anchored within the same settings. However, for some reason the piece seemed to work better on screen than on the stage. The cinematic expansions remain minimal, but Kazan gives it a force and life that appear impossible to achieve in a theater. As such, though Streetcar still shows signs of its origins, I found it to provide a well-executed move onto the big screen. Ultimately, A Streetcar Named Desire comes across as a cinematic classic that deserves its acclaim. From some terrific performances by its leads to a cleanly and vividly adapted move to film, the movie fires on all cylinders. Despite my general dislike of stage material, I thought this one was a winner. 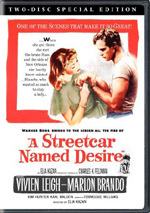 A Streetcar Named Desire appears in an aspect ratio of approximately 1.33:1 on this single-sided, double-layered DVD; due to those dimensions, the image has not been enhanced for 16X9 televisions. While the transfer didn’t excel, it certainly offered a perfectly solid picture for a 55-year-old movie. Sharpness was very good. Only a smidgen of softness interfered in a few shots. The rest of the flick appeared nicely detailed and distinctive. No issues with jagged edges or shimmering, and I noticed no signs of edge enhancement. Black levels seemed deep and rich, and contrast appeared solid. Streetcar presented a clean gray image that suited the production. Shadow detail looked good, as low-light shots demonstrated nice delineation. A few source flaws cropped up, but not anything significant. I saw occasionally specks and marks, and grain came across as a bit heavy at times. None of these really interfered with the presentation, though, and the movie usually seemed quite clean. I debated whether I should give the transfer a “B+” or a “B”. I went with the higher grade because I thought it handled difficult material – all those interior shots – and seemed quite positive given the movie’s age. I found the monaural soundtrack of Streetcar to provide a clear but unexceptional auditory experience. Speech seemed acceptably natural and distinct, with no signs of edginess or problems related to intelligibility. Effects were clean and relatively accurate, and the score appeared fairly bright and vivid. Both elements lacked any substantial dynamic range, however, as the track seemed thin in a manner typical of audio from the era. Ultimately, it represented the material adequately and worked fine within those confines. How did the picture and sound of this new DVD compare to those of the original 1997 release? I felt the audio was very similar, but the new transfer vastly improved on the old one. That image displayed lots of defects and had other problems, whereas this one was much cleaner and better defined. It offered a substantial step up in visual quality. The new DVD also includes many additional supplements not found on the prior release. On Disc One, we start with an audio commentary from actor Karl Malden as well as film historians Rudy Behlmer and Jeff Young. All three were recorded separately for this edited piece. Malden emerges as the most prominent participant here. He tells us about his experiences with the play and movie and offers many stories about his work. 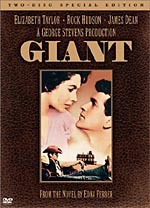 Behlmer gets into the background of the play and film and traces its path to the screen, while Young mostly concentrates on subjects connected to director Elia Kazan. Young has the least to say here; frankly, I find it hard to remember much of his material. A veteran of many commentaries, Behlmer provides his usual solid examination of the production. He presents quite a few useful insights into matters. Malden proves surprisingly strong. I’ve experienced too many boring actor commentaries and view them with caution, so I’m pleased to report that Malden helps us understand the work and the participants well. This ends up as a consistently engaging and enjoyable look at Streetcar. Also on Disc One, we get an Elia Kazan Trailer Gallery. This features ads for Streetcar, East of Eden, Baby Doll, A Face in the Crowd, Splendor in the Grass, America America and both the 1958 and 1970 reissues of Streetcar. Moving to Disc Two, we open with a documentary entitled Elia Kazan: A Director’s Journey. Created in 1994, this 75-minute and 24-second production includes the usual allotment of movie clips, archival materials, and interviews. Narrated by actor Eli Wallach, we hear from Kazan as he covers his career. “Journey” traces Kazan’s path to the stage and how those experiences affected him, his desire to work in films and his move in that direction. We also learn about the movies he directed and his thoughts about many of them. The lack of participants other than Kazan surprised me, but I found this to be a pleasing and satisfying choice. The decision allows this to become an autobiographical piece, and I like the lack of fawning praise that usually comes with the comments of others. Granted, this means we also lose a certain sense of perspective, but Kazan’s self-analysis more than compensates. The only minor disappointment comes from the way “Journey” glosses over Kazan’s “naming names” period. The program doesn’t ignore this major aspect of Kazan’s life and legacy, but it zips through it quickly and doesn’t challenge anything. One can argue that “Journey” doesn’t need to deal with Kazan’s anti-Communist testimony since the show focuses on his career, but I think his actions affected his work and need to be discussed. However, I understand that Kazan was always very reluctant to go into this part of his life, so the filmmakers may not have had much choice other than to skip it. The lack of depth in this area creates a minor weakness for “Journey”, but not a fatal flaw. Instead, it presents a worthwhile examination of the director’s career. Five featurettes follow. A Streetcar on Broadway goes for 21 minutes, 54 seconds and includes comments from Kazan, Malden, film historian Rudy Behlmer, author Richard Schickel, and actor Kim Hunter. “Broadway” looks at the career of playwright Tennessee Williams and the development of Streetcar as a stage production. We follow the selection of Kazan as director, casting, rehearsals and performances, Kazan’s direction and the show’s legacy. It gives us a pretty nice look at aspects of the stage production and turns into a useful piece. The 28-minute and two-second A Streetcar in Hollywood presents remarks from Malden, Kazan, Behlmer, Hunter, and Schickel. As implied by the title, this one focuses on how the stage play shifted to the movie screen. We learn about the acquisition of the project and its adaptation as well as selecting the director and cast, comparisons between Jessica Tandy and Vivien Leigh, shooting the film and aspects of the production, characters and performances, and the flick’s reception. “Hollywood” is a clear companion piece to “Broadway” and offers the same strengths. It creates a nice exploration of the issues connected to the movie. Censorship and Desire lasts 16 minutes and 15 seconds. It features Malden, Behlmer, Schickel, Hunter and record producer Robert Townson. “Censorship” addresses problems taking the play and making it palatable for the screen. We learn about the changes made to allow this to occur as well as elements restored from the edited 1951 version. This provides a strong look at the specific alterations and creates a compelling show. For a look at the score, we head to North and the Music of the South. This nine-minute and 10-second show features Townson as he chats about the career of composer Alex North, the score of Streetcar and his personal relationship with North. Townson provides a lot of insight into the movie’s themes in this tight little program. Called An Actor Named Brando, the final featurette runs eight minutes, 50 seconds and offers notes from Kazan, Malden, Hunter, and Schickel. The show delves into aspects of Brando’s personality and work, with an expected emphasis on Streetcar. Though we get some of the expected praise, we also find insights about the actor. Those help make this a better than decent discussion. Some interesting outtakes add to the experience as well. Two archival pieces complete the disc. A Marlon Brando Screen Test lasts five minutes and four seconds. Shot in 1947, it shows a scene with Brando and an actress as well as a short chat between him and an assistant. 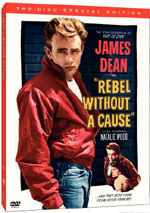 It’s not clear for what film Brando auditioned – the slate states Rebel Without Cause, but it doesn’t clearly resemble the James Dean classic - but this is a very cool piece of history nonetheless. Finally, we get two sets of Outtakes. These include 15 minutes, 35 seconds of film pieces and 16 minutes, 45 seconds of audio outtakes. In regard to the movie snippets, a few interesting elements appear, but most of them are brief and mediocre. The audio takes are on the same level, as they present some intriguing extensions of existing sequences but suffer from a number of dead spots and repetitions. While the various outtakes didn’t thrill me, I’m still glad to find them here. A Streetcar Named Desire provided a surprisingly engaging and compelling effort, mainly due to some excellent acting that virtually leapt off the screen. The disc offers very good picture along with decent audio and a fine collection of extras. 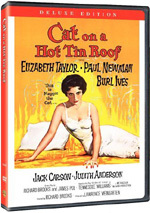 I heartily recommend this DVD, and that goes for owners of the prior release; the new one acts as a strong upgrade.